We all know that the training landscape is rapidly changing; we need to be able to get learning content to our learners as quickly as possible, to stay ahead. This is where tools like Articulate Storyline meet the needs of the new age learner. Articulate Storyline can successfully transform your training material into an engaging and interactive online course, quickly and seamlessly. From simple PowerPoint to e-learning conversions, to the complex Flash to HTML5 conversions, it can handle anything you throw at it. With Storyline, we’ve created a host of solutions for our clients, here is what you can do with the tool. The attention span of the Twitterati is very less; they need everything bite-sized. Your lengthy legacy courses, spanning 1-2 hours, will bore your learners to death. The best way to make good use of your investment in legacy courses is to turn them into microlearning modules. Using Articulate Storyline, you can create visually rich microlearning courses, within a matter of days. The tool lets you incorporate assets like real-world scenarios, videos, games, infographics, interactive PDFs, how-to demos, quizzes, and much more. These bite-sized courses work effectively on iOS and Android devices. The tool has a PowerPoint-like interface, making users feel right at home. One can immediately get started with developing e-Learning courses from scratch using the built-in templates provided in the tool. Users can also customize the templates as per their requirement, to make it look exclusive. The tool has built-in characters, players, screen recording ability, and a wide variety of interactivity and assessment templates. The tool powers you with triggers, variables, and states, to quickly convert any of your documents into interactive e-learning courses, quite effectively. 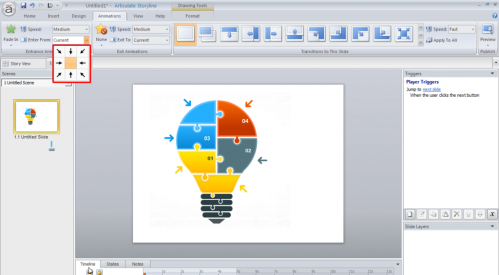 You can quickly convert hundreds of PowerPoint presentations to e-Learning with this tool. The tool has an option to import PowerPoint decks, and you can add interactivities, assessments, audio, and video, and publish it to HTML5, so that the course can be seamlessly accessible on mobile devices. Legacy courses are those developed using Flash, Dreamweaver or earlier versions of authoring tools. These courses are redundant now as they do not meet the contemporary learning needs. Let’s see how Articulate Storyline helps you in this regard. In earlier days, Flash was predominantly used to develop e-Learning courses. Fast forward to present day; these courses no longer work on mobile devices, since Flash is not supported on these devices. The only solution is to redesign these courses from scratch or convert these course to HTML5, using a rapid authoring tool. Articulate Storyline is the best tool to get this job done because you can create Flash-like interactivities using the triggers, slide layers, states, and variables of this tool. The tool has the option to publish courses into HTML5, enabling people access the course on mobile devices. Also, you can publish the course to Articulate Mobile Player, a native app available for iOS and Android devices. Legacy courses developed using earlier versions of rapid authoring tools like Adobe Captivate, Lectora, and Articulate Storyline, have limited interactivities and are more of page turners. Also, these courses do not work on mobile devices. You can beautify these courses by importing the old file to Articulate Storyline 2 and updating the course. Storyline offers great features to create highly engaging interactivities, animations, and offers excellent support to develop multi-device compatible courses. Take a look at the differences between two versions of the same tool. SCORM is an acronym for “Sharable Content Object Reference Model.” It is a set of technical standards, helpful for e-Learning. It supports interoperability between eLearning and the software – how the course communicates with its underlying platform. Small and mid-sized organizations have huge learning resources in the form of eBooks, PDFs, Word docs, videos, and presentations. These resources can be made SCORM compliant, to track the completion status, number of times learners accessed the resources, time spent on these resources, etc. These resources can be imported into Articulate Storyline and with just one click, and made SCORM compliant. Now, these resources are ready to communicate with your LMS. If there are any assessments in your Word doc or PDFs, you can pull these questions into the Articulate Quiz Maker. You can just tell your learners to read the Word doc and answer the quiz questions on the LMS. Most of the old e-Learning courses and other learning resources are not SCORM compliant. Section 508 gained importance when the U.S and Canada made it mandatory that courses should comply with section 508 or WCAG 2.0 guidelines. Using Storyline, you can make your courses comply with these standards, without much effort. The tool’s interface is compatible with these standards and the menu items are read by JAWS (screen reader). Setting the tab order is easy, and with ALT text, you can manage Tab and Focus Order for all objects on a slide, in a single dialog box. Read this blog to know more about making your courses Section 508 and WCAG compatible, using Storyline. These are some of the ways in which you can use Articulate Storyline to cater to your training requirements. 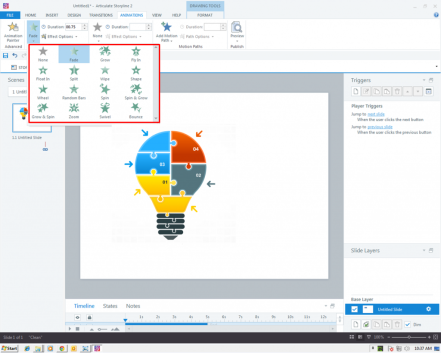 No matter what format your training content is in, you can find a viable solution in Articulate Storyline to develop learning courses quickly and creatively.